In the USA, the Friday after Thanksgiving, or Black Friday, is a major shopping day. Each year showcases huge sales and the mobs that attend them, and the day always includes at least one episode of heated exchanges over products getting out of control. Why do we engage with commerce in this way? Is it benefiting us? There is nothing wrong with wanting to get a good price, but as November, with all its emphasis on abundance and nourishment, comes to a close, and we look towards December and its huge emphasis on consumerism in the lead up to Christmas, we want to make sure that we stay connected to ourselves by engaging with mindful consumption. I learned mindful consumption through participating in EFLI NYC, EFLI’s spring break program that focuses on the importance of sustainable fashion. In that program, we discussed fast fashion and how easy it is to not shop intentionally; to be lured by cheap prices, without considering what makes the clothing so cheap. I now look at price tags in more complex ways, and take into consideration how something is made, and why it costs what it costs. Now, even with things I own, I donate what I can instead of throwing it away, and work to be mindful about what I need versus what I want. Asking myself before I buy anything- do I have this already? Why do I want to buy this? And if I want to buy something, I make sure to take into consideration where the item was made, and what materials are in it. Recognizing why I am choosing to look at a screen has helped me be more mindful about when and how much I do it. Am I actually interested in scrolling Instagram, or am I stressed about what my boyfriend just said? I’m watching this TV show because I need to have a mental escape from my busy day, or because I am avoiding something else that would be better for me? EFLI taught me to ask more questions about the clothes I buy. The big question I now ask about my clothing is: How many hands have been involved in the creation of this clothing? Also: do I agree with the value on this price tag? I think mindful consumption is when I spend time on meaningful things, and spend money on necessary things. It makes me less wasteful, and inspires me to reduce what I buy, and recycle and re-use everything that I do consume. Mindful consumption can feel like an oxymoron, but I think it’s when you take steps to define what it means to consume in a way that is healthy or manageable for you. I know that, for me, I have to be aware of everything that I am consuming, and where those things come from. It is as important to know where your food is from and who makes your clothes as it is to know who is buying ads on the social media apps you use or the television you watch—there is so much to consume, and we have to be really mindful about the impact our choices make. Consuming anything mindfully leads to a feeling of wealth, richness, because it allows me to look for the innate quality of goodness and value in all that I consume. I think mindful consumption stems from asking myself if I really need something. I don't generally buy things in excess. We are all consuming things every day - food, products, ideas, images - mindful consumption would mean reflecting on all of that intake and making a choice about each one of those things. Thanksgiving is around the corner, which means that we are thinking a lot about nourishment. Nourishment is a word typically associated with food, but it’s also a word we find ourselves using when we explore ways to stay connected to ourselves during this hectic time of year. Whether or not you choose to celebrate Thanksgiving, we hope you can find time to take advantage of this time of year as a moment where we can hit pause and give gratitude for the conversations we are having about abundance, nourishment, and mindful consumption. What are they, and why are they important? Everyone at EFLI has differing opinions about what these words and concepts mean, so we wanted to share them here. This week’s topic: How do you nourish yourself? Finding time to eat is really important, but so is finding time to spend with my friends, reading books, and being quiet. Nourishment is anything I’m consuming: from what I eat to what I wear, and being conscious about the effects of my consumerism. It’s how I protect the relationship I have with my body and my mind. It’s how I choose to engage with the world around me. I find nourishment when I create space in my life to enjoy pleasures that aren’t rooted in work or school, like taking a bath, getting my nails done, going to a museum, hanging out with my friends, drawing, spending time with my family, and traveling whenever I can. I feel nourished when I surround myself with friends and laughter, and also when I allow my body to sleep as much as it needs, make time to go to therapy, and watch the sun rise or set. Silence is a form of nourishment--it allows me to listen to the world around me. I also like to nourish myself by dancing in the shower! I find nourishment to be a daily practice in and of itself. Each day I think about nourishing the mind, body and spirit/soul. In addition to mindful eating practices (not gonna lie, I had a giant, gooey, chocolate chip cookie yesterday and felt nourished by the decadence, so my definition of mindful eating is more about consciously eating things I love), I have started playing piano again - I find the practice of reading music and learning a new piece to be incredible stimulating and nourishing. It activates my brain to read the language of music when starting a new piece - and then my body/soul when I play and hear the piece. Yoga and regular physical activity really support my nourishment as well. I find I'm a much better person when I have gone to the gym or done something that aligns my mind back together with my body and spirit. Former EFLI participant Jessie Heller is a student activist whose anti-gun work was recognized by Dazed magazine this past summer. Watch this short video to learn more about Jessie's journey, and please join her and other EFLI alums tonight at 6:30pm EST for "Too Young to Vote?" a conversation and resource guide for young people who want to make a difference in their communities, but are too young to vote! Tonight's event is online, and open to all. With the days getting shorter and the holiday season fast approaching, along with all its pressures to buy gifts and experience this time of year in specific ways, it can feel difficult to stay connected to ourselves. Instead of letting these pressures distract us, we want to remain engaged with the gifts this time of year can offer anyone: a moment in our calendars to hit pause, reflect, and re-connect with ourselves. 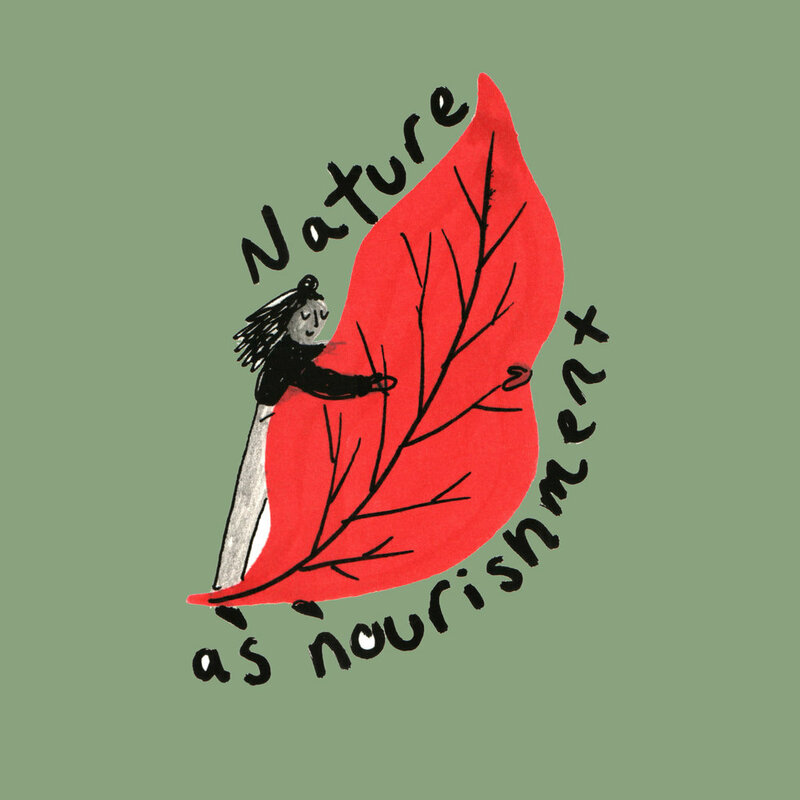 As we pull out our sweaters and think about where we want to spend our time off from work this year, we have also been discussing abundance, nourishment, and mindful consumption. What are they, and why are they important? Everyone at EFLI has differing opinions about what these words and concepts mean, so we wanted to share them here. First up: What is abundance? Abundance means not just having enough, but having more than enough. When you have abundance in your life, you accept what you have and don’t ask for more. The feeling of having plenty of something, whether it’s a literal object or a feeling of love or connection, is my definition of abundance. I feel abundance when I am able to see the good in situations, and when I feel capable of shifting my mindset from one of fear towards one of bravery. When I have an abundance of resources, that means I have all the tools I need to do what I want to do. This makes me feel capable, empowered, and confident. Abundance is the ability to fully enjoy what you have, without guilt. Abundance is the feeling of having enough while also knowing that there is enough for everyone's needs to be met. I think abundance can be a mindset (i.e. the difference between have a poverty mindset vs. a mentality of abundance). When we operate from a place of abundance, we are filled with gratitude, generosity, caring for others, and a deep sense of possibility. Abundance is contentment. When I experience it, I have a feeling that I can share openly, because there is nothing I have to protect or hold back. October is almost over, but we will remain mindful. Here are some closing thoughts from the EFLI community about what mindfulness means to them. Mindfulness is being fully present and in tune with myself, my body, my surroundings, my actions, and the impact of my actions. Working out feels very meditative for me because it really helps me get in touch with myself and my body. Journaling and drawing allow whatever is brewing to come out and onto the page, helping me connect with what's going on in myself without having to think about it too hard. Sitting in silence is a way for me to set intentions for myself; usually after I work out and stretch every morning I give myself a moment of silence and set some intentions for myself for the day. I think finding ways to practice mindfulness in some of the smallest and simplest actions of my day really helps me feel more present and full. Like when I walk and practice mindfulness, I really try to take in my surroundings using all senses, and just focus on being as fully present as possible. For me, mindfulness makes me feel meditative and calm. When I am mindful I feel more present and aware, and a joyful sense of energy that connects my self with the people around me and the environment I'm in. Mindfulness to me is practicing awareness. It means shifting my attention to myself, observing what I am paying attention to, and then--when necessary--shifting those observations towards something that feels more productive. It helps me get more attuned to my sense of direction and purpose. Why do you want to be more mindful? Mindfulness means bringing the fullness of the present moment to your body, mind & spirit. I practice it by taking an actual minute to stop, breathe, and reflect on the current reality or situation I am facing. Pausing in this way allows me to see what I may be missing, or offers up answers I wouldn’t have come up with if I didn’t allow myself a moment of stillness. My mindfulness practices are really varied. Sometimes I practice mindfulness by engaging with other people and doing something fun or meaningful, and sometimes I practice mindfulness by giving myself the space I need to listen to music and have alone time. Mindfulness to me means taking good care of myself mentally and physically, both at home and at work. I define “taking good care of myself” as doing yoga, being a good communicator, looking at family photos or listening to music when I am stressed, and doing breathing exercises. Yoga is my regular mindfulness practice. I do meditate but I often find that I need to work out the energy in my body in order to center and become more aware of my thoughts, attention, or awareness itself. When I am mindful, I gain a sense of clarity and ease in my life. I can prioritize more clearly and be more attuned to my intuition - what I want, what I need and what I love. I'm less focused on what my friends or family might want me to be and able to be more of myself. I also find I am able to focus more when I need to - I can be present and show up more fully. Mindfulness. It’s a word (and a concept) we hear about all the time. But what does it mean, and why does EFLI put so much emphasis on it? The responses we received were so varied that we realized we want to share what everyone said, in the hopes of spreading understanding that there is no single way of being mindful. When my brain is full of daily worries and anxieties, I use mindfulness to empty it, and invite my mind back into my body. I pause, exhale, and ask myself “can I bring love into myself, so I don’t react harshly?” Life is so much more colorful when you are able to have patience and tolerance towards yourself and others. When I engage with mindful practices I feel engaged with the purpose and process of my life, and can better see its many gifts. I don’t think it’s possible to be mindful without starting with self care, so to me, mindfulness is taking care of myself mentally, physically, and emotionally. I practice it by taking long walks outside, listening to music, disconnecting from technology, and going to therapy. I use “mindfulness” and “heartfulness” interchangeably, because when I am being mindful I am working from the place in my heart that is present and paying attention. There are many different ways of practicing it. I think running can be as much a mindful practice as meditation, because a mindfulness practice is any forgiving way you find to get yourself back on track when you feel like you’ve gotten off course. With mindfulness, I can recognize when I’m getting caught up in drama or other unnecessary emotions, and helps me to take a step back, honor my feelings, and then let them go. This allows me to expand my awareness to include the world around me, and it helps me to enter into everyday interactions with curiosity and kindness. EFLI Participants Give Meaning to "The Future is Female"
This summer, EFLI fellows and facilitators teamed up with Christa Myers from Eileen Fisher Inc. to produce a video responding to the prompt “The Future is Female.” Watch the video to see what it means to them! This September, EFLI is kicking off a brand new Fall program: Awareness Based Collaborative Theatre (or ABC Theatre), with lead facilitator Edinson Rodriguez-Castaño and EFLI’s Executive Director, Antoinette Klatzky. Over the last nine summers, EFLI’s closing ceremonies have been centered around plays that EFLI summer participants create together. This practice is an integral aspect to our leadership development training and has deeply impacted our community by sparking conversations among parents, teachers, friends, and local government officials. In this post, Antoinette answers some questions about what this new program is about, and why we think you should register for it! What is Awareness Based Collaborative Theatre? ABC Theatre is a combination of theatrical and embodied forms of expression and leadership development that uses methodologies from Theatre of the Oppressed, Leadership Embodiment, and Social Presencing Theater. The aim of engaging with ABC Theatre is for participants to learn more about how plays can help us understand the ways society evaluates itself, and to better see where individuals can activate new alternatives to current problems. The program has been developed by combining aspects of the works of Wendy Palmer's Leadership Embodiment, Augusto Boal's Theatre of the Oppressed, and Arawana Hayashi's Social Presencing Theatre. Having facilitated elements of these disciplines in the last nine years of summer programs, Edinson and I have been working on an engaging curriculum to share these practices with young people during the school year. Why has EFLI added this program? Each summer, EFLI watches young people’s confidence in their ability to articulate and engage with their individual needs blossom. We have added ABC Theatre to our yearlong offerings in the hope that this program will offer young people a real channel with which to share the challenges they face, and serve as an opportunity to open up intergenerational community dialogue. Young people, specifically young women, are a voice of wisdom for their generation. But all too often, when young people express their needs, their pleas fall on the deaf ears of the adults around them. We are hopeful that this program will change this paradigm, and lead to tangible changes for young people in their communities. Our hope is that all participants in ABC Theatre will expand their journeys of personal growth and development through storytelling, build solidarity with each other by collaborating in an open, judgement-free environment, and actively spark community engagement on the social and societal issues they face by confidently sharing their truth. The program is for young people ages 14-18. Ultimately, as the plays are shared and audiences participate, the program will be for entire communities! ABC Theatre will be held at The Eileen Fisher Learning Lab, 50 S. Buckhout St., Irvington NY every Thursday from 4-6pm from September 27-November 15, 2018. To register please click here. At the beginning of July, the Eileen Fisher Leadership Institute summer team convened at the scenic Wainwright House in Rye, New York. The three-day retreat was filled with activities that solidified the bonds between co-workers, making them not only friends, but a team. Continue reading for more! The Wainwright House was buzzing with positive energy and hopes for the three days. Decorations were being put up to help create a space unique to EFLI, and name tags were being craftily designed to give a small visual introduction to each staff member. Day one was off to a great start after discussing goals for the seven weeks of the EFLI summer. The Connection Circle brought together members of the staff by creating a forum to share aspects of their personal life that they were bringing to the table. With the outer circle moving to the left, each individual took a minute to speak to their partner, listening intently to each other with an open mind and a compassionate heart. The circle broke so that staff members could get to know each other on an even deeper level through a Dialogue Walk. The second day of the retreat began with yoga to reconnect the mind, body, and spirit. After discussing the activities for the summer, the group worked with workshop leader Ivan to write a song about our “honey.” “Honey” was used here as a metaphor for the passions that we have that influence others in ways that are not always obvious, but are still impactful. Past participants and fellows joined the group for the later half of the day as a reminder that the bonds made at EFLI are long-lasting, memorable ones. These past participants not only marveled at the work that was being done, but radiated love and support for the summer that they knew the current staff was about to have. After a communal dinner, the team headed outside for a game of soccer while the sun set. The day closed with Cosmomo, an activity that allowed the staff to discuss their experiences in life with things such as love, heartbreak, great achievements, relation to heritage, and more while sharing their musical talents. In creating a space of affirmation and understanding, the staff grew closer. Day two was packed, though extremely rewarding, leaving the staff excited for the third and final day of retreat. The sun rose on the Wainwright House as staff convened for yoga that turned into a silent breakfast and continued into a period of silence. The period of silence allowed the staff to reconnect with nature and the space that was created on the first day of the retreat, reminding them of the power of their words and of verbal communication. After lunch and Fellow Skillshares, staff prepared to leave the space, and got ready to close the retreat with a Gratitude Circle. Here, fellows, staff, and interns came together for the final time this weekend to share with one another the impact that they had on each other, and to express thanks. The retreat came to a close with the song, "One Voice," by the Waillin’ Jennys. The song reminded the staff that even though each person brings something unique and important to the space this summer, together, the staff has one voice that will continue to teach and influence others. The retreat was complete, and hearts were full. The staff, interns, and fellows of EFLI are excited for what the summer will hold. They are currently preparing to welcome the participants of the first program of the summer: Activating Leadership. Meet Emily Langtiw: Conscious Fashion Blogger! We first met Emily Langtiw when she joined us for EFLI NYC, our spring break residential program in New York City that focuses on the intersections of design and sustainability. Emily currently lives in Chicago, and is a rising junior at the University of Illinois Urbana-Champaign, where she studies advertising. Emily has also recently partnered with EFLI on Instagram for our campaign “5 Days, 5 Ways,” showcasing how to re-use and re-cycle the same article of clothing for 5 days in a row. Follow along on that journey here! We have been consistently impressed with Emily’s commitment to sustainable and ethical fashion, and love following her journey on her blog, Seashorties, where she documents her commitment to learning all that she can about sustainable fashion, ethical living, and more! Read on to get to know more about this amazing young leader. Hi! I’m so glad to speak with you today. And we are so happy to be speaking with you! Can you tell us how you first heard about EFLI? I found the application for the EFLI NYC program in the ethical index network, an online resource for people who are invested in developing ethical and sustainable practices in their businesses and lives. The program seemed like a fabulous opportunity to me, and it was! What were your biggest takeaways from your experience in EFLI NYC? I learned that clothes can be “designed to be re-designed,” an idea that I know Eileen Fisher is always working on. This is so interesting to me, because most people think of clothes as a single-use item, meant to be worn for a specific event or season. But when you designing to redesign, pieces can have more than one life, be used for more than one season, and have more than one purpose. This combats textile waste at all stages of the creation of an article of clothing, and stretches the boundaries of fashion in really exciting ways. Fashion is an art form, and we are so far from understanding an article of clothing as a piece of art when most of our clothing is meant to be used for a single purpose, and then thrown away. What first sparked your interest in sustainable fashion? In high school I became a brand ambassador for a philanthropic fashion company, and I liked the idea of using fashion as a means of promoting good causes. Once I became a student at the University of Illinois at Urbana-Champaign, I founded and directed the Brands Give Back Sustainable Fashion Show. In total, we raised over $700 for the Rainforest Alliance. We are no longer producing events, as there is another sustainable fashion show on campus that promotes student designers, but our members have joined forces to participate in Sustainable Fashion Chicago! Was the experience of producing these fashion shows the inspiration behind starting your blog, Seashorties? Yes! I started writing Seashorties in December 2017, a few months before I joined EFLI NYC. The name of the blog describes me: I love the ocean, and I am really short! I started writing it because, through my experiences in high school and my research, I realized that I could promote sustainable fashion as a way to help spread awareness about conservation efforts from individuals, organizations, and brands that are already doing the work to change our impact on the natural world. I also write the blog because I want to always remain accountable for being a conscious consumer myself. That’s really great. So why is sustainable fashion so important? Most consumers only care about clothes being cute and cheap, and not about the environmental and human impact that goes into making those clothes. This lack of attention to the process behind the clothes hanging in our closets is really problematic, as it contributes to climate change and the ongoing exploitation of workers. It’s interesting to me that people think taking sustainability into account when they buy clothing isn’t important, and that we can continue to treat people and the planet poorly, and these choices won't matter in the long run. But we are seeing already how the choices we make are catching up to us through the effects of climate change, and our changing world. I’ve learned that committing to only buying sustainable and ethical fashion is a way to stand up for what I believe is right. I think it’s really important to know who makes our clothes, where the fibers for the clothes were sourced from, and how well the workers who made my clothes were treated. I don’t want to participate in subjugating people or the earth because an item of clothing is cute and cheap—I want to feel good about what I wear, and to know that my actions are not causing suffering. How do you think a commitment to sustainability in the fashion world is connected to leadership? The fashion industry is still run by men, even though most buyers are women, and most fashion is aimed at female consumers. I think that women designers like Eileen Fisher and Stella McCartney are advocating for values that a lot of women believe in— they are actively building efforts to offset the industry’s contribution to climate change, ending exploitation of factory workers (most of whom are women), and offering consumers smarter, better choices for their money. We need to see more leadership like that. And I want to see more women take control of the industry so that more companies will reflect the values that I think women care about. On a personal level, I see my blog as a way for me to be a leader in creating awareness about sustainability and ethical choices. On Seashorties I write a lot about the fact that you can always make a choice in what you consume, and, although it takes a lot of time to find resources to share with people interested in living sustainably, I take pride in the work that I do to spread awareness in my online community. What do you say to people to think they can’t afford sustainable fashion? The money issue is a big deal, because it’s hard to work around the elitism in many high end sustainable brands. But it’s not impossible! It’s true that, for most sustainable fashion brands, we pay more for clothing in order to offset the costs of paying workers a higher wage, and for ethically sourced fabrics. While most people talk about buying higher quality clothing less frequently, I think instead it’s helpful to remember that sustainable fashion doesn’t have to mean high end fashion! It can also mean shopping at vintage and second hand stores, upcycling your own clothes, or participating in clothing swaps. I love getting hand me downs from my aunts and sisters, because even though the clothing may not be completely new, it’s new to me. And if you can reclaim, or redesign a piece of clothing into something that you can love again, that, to me, is what fashion is all about. You can also rent dresses online, borrow from your friends, and easily find apps where you can sell and buy your clothes online. I’ve been traveling a lot this summer, and that inspires me to open up my mind to more designers, brands, and styles. I also spend a lot of time in nature, with my friends and without my phone, hiking, canoeing, and wandering around. Our decisions right now are going to determine if we can preserve the beauty of the natural world, and I want to be sure that I am doing all I can to protect our beautiful earth! Thank you, Emily! Keep up the amazing work! We are so proud to celebrate these incredible women on December 8th at our Gratitude Gathering in Irvington, NY. For tickets please visit this link. Kay Cioffi has been a connector in the technology sector since 1995. As President of Sequitor Partners LLC, she has worked with numerous Fortune 500, mid-market and nonprofit clients on executive recruitment, board development, professional branding and social impact. An active volunteer, Kay serves as the Chair of the Community Service committee at the School of the Holy Child and Advisor to the CEO of the Children’s Art Guild. Previously, she served on the Board of Trustees of Mercy College and was Co-Chair of the Founding Board of Girls Inc. of Westchester County, the launch of which was made possible by the generous support of the Eileen Fisher Community Foundation. Kay graduated from Southern Methodist University and attended the Women's Director Development program at the Kellogg School of Management. She lives in Westchester County, NY, with her two teenage daughters, their rescues (Dakota and Parker), husband Joseph Cioffi, a partner at the law firm of Davis & Gilbert LLP and author of the Credit Chronometer. In her spare time, Kay advises the founders of the tech startup, peripherii, on introducing to market beautiful and functional Bluetooth-enabled earrings. Meika Hollender is the Co-Founder and Co-CEO of Sustain Natural, a new brand of sexual and reproductive wellness products for women. She is also the creator of GetOnTop, a national campaign aimed at getting women to take control of their sexual health. She received her MBA from New York University's Stern School of Business, where she was the President of the Social Enterprise Association. Meika has also done stints at the brand strategy and design firm, Sterling Brands, and at Johnson & Johnson as a Sustainability Associate. She writes frequently on sexual health issues and advocacy for publications including Refinery 29 and is the co-author of the book Naturally Clean. Through Sustain's 10%4Women initiative, she is proud to work closely with Planned Parenthood. Meika was also recently named one of Fast Company’s Most Creative People in 2017, and listed on Forbes’ 30 under 30 and Inc's 30 under 30 lists. Meika's currently working with Simon & Schuster on her new book Get On Top, to be released in March 2018. Jamie Cass is a student at Hunter College and participated in EFLI's Activating Leadership Program in 2013 and returned for additional offerings in 2014. And also supported the inaugural NY Sustainable Fashion Spring Break program in NYC in 2016. She's also been an intern at Sustain Naturals and at the American Civil Liberties Union. Alexandra Bell completed EFLI’s Activating Leadership Program in 2013, and now continues to support EFLI’s growth by spearheading the efforts to bring EFLI to Japan. Join us December 9 at our Gratitude Gala 2016, where will honor her passion and embodiment of EFLI values in the world. Alexandra took the time to answer our questions about life, leadership, and inspiration. Please read on for her courageous and inspired answers. AB: The summer I participated in Activating Leadership, EFLI provided me with a community of women who listened, supported, and learned with me when I needed it most. Ever since, the EFLI community has been a second home to me. I have learned so much at EFLI and continue to value and embody EFLI philosophies and practices in my life. EFLI pushes me from a place of love, which has helped me grow as a person. EFLI encourages me to pursue my passions and dreams. Through my work continuing to support EFLI's growth, I have been able to meet with incredible women organizers in Japan and, this past summer, had the opportunity to co-facilitate a workshop with my sister on art and social change. The EFLI community has become a second family for me that is ever growing and evolving. I know that whatever I do and wherever I go in life, I have a community of people who will support me through it. AB: My leadership style is constantly changing and evolving as I continue to learn and grow. Key aspects of my leadership style I would say are listening, positivity, and collaboration. Listening: I believe listening is really important in leadership because not enough people in power actually listen to others, choosing instead to silence them. I work to practice real, deep listening with everyone I engage in conversation with. Positivity: I am a very positive and optimistic person and maintain these attributes as a leader. I try to see the best in every situation and have a positive attitude when working. I work from a place of love, anger, and hope and I try to emulate this when working with others and in leadership roles. Collaboration: I believe that when everyone is able to actively participate in a project, the project is only strengthened. We all have so much to learn from one another. AB: I think young people face many challenges that are unique to the individual and are not faced alone. Before joining EFLI, I felt really isolated. Even though I had friends in school and played on sports teams, I still felt alone. Through EFLI I saw that the challenges I was facing were valid and real. I learned the language to name these struggles and found a community to work through them with. I believe it is really important for all people to have communities that are founded on deep love, support, and connection and don't think we have enough of these spaces for young people. AB: My mom inspires me, each and everyday. I am inspired by her strength, compassion, love, wisdom, confidence, and resilience. On Friday, October 24th, the Eileen Fisher Leadership Institute (EFLI) facilitated two workshops for Ogilvy & Mather’s “You Matter” employee appreciation event. Ogilvy, an international advertising agency, hosted “You Matter” to invest in its employees and work towards cultivating a “makers culture” within their company. Speakers and organizations, including EFLI, were invited to share their work and spark inspiration and creativity among Ogilvy employees. Workshop attendees worked in small groups to create sculptures that communicated a story or statement of their choice. They were invited to tap into their creativity and use recycled materials such as EILEEN FISHER fabrics, clean trash and fallen tree branches. Through the combination of background on EFLI and EILEEN FISHER with an upcycled craft, workshop attendees learned about the institute and company’s unique social missions and leadership models, thought critically about sustainability and explored group collaboration and personal creativity. One team spoke to ethical farming practices, creating a farm out of a shoebox that featured cows and vegetables sown from EILEEN FISHER fabric. In the spirit of Thanksgiving, another group sewed and embellished a neck piece and gloves, with the message to keep warm even when facing life’s everyday challenges. EFLI workshop facilitators noticed a creative thirst for hands-on activities among working adults and were excited to witness the artistic collaboration of employees from diverse departments around a common goal. In processing the activity, employees expressed feeling surprised and delighted to engage in this project in a workplace setting and said they would bring an attitude of building off one another’s ideas back into their work at Ogilvy. Several Ogilvy employees are interested in getting involved with EFLI programs, Green Eileen workshops and other initiatives of the developing Lifework Space, and EFLI and Ogilvy are looking forward to partnering again in the future. Hello! I’m Fatimah Huda, a graduating senior at Saunders Trades and Technical High School in Yonkers, NY. I am also a mentee through the Her Honor Mentoring program, which is run by Judge Judy’s daughter, Nicole Scheindlin. I was matched as a mentee with EFLI, which is great because I am an avid feminist. On Monday, October 13th, Wisdom 2.0 Next Generation took place at the prestigious New York University. The event was an opportunity for millennials to come together and explore personal purpose and living a life with meaning. I attended the event with staff from EFLI, members of EFLI’s Youth Ambassador Board and a group of EILEEN FISHER employees. The audience was made up of many people each carrying a different story. When members of the audience were asked to share a few words before the speakers began, one young woman explained how she had come to “the city that never sleeps” all the way from Georgia and wanted to incorporate her learnings from the event into a major project she was doing for school. Another young woman explained that her professor at Manhattanville College had promised her and her fellow classmates extra credit if they attended the event. Two speakers really grasped my interest. One of them was Miki Agrawal, a “serial social entrepreneur,” who was funny, sociable, and inspiring. What really interested me about Miki was that she was a Cornell graduate who had given herself three goals after college: playing soccer professionally, making a movie and starting a business. I was surprised to learn that Miki had successfully completed all three of these goals. Miki’s commitment to empowering women is also what made me relate to her. After visiting South Africa and meeting a young girl who was not attending school because did not have the proper feminine supplies for her menstrual period, Miki and two of her colleagues (including her twin sister) worked to create underwear that would help all women during their time of the month. They eventually created THINX, underwear which is not only pretty, but also technically advanced having a unique combination of leak and stain proof materials. THINX partnered with AFRIpads in Uganda to provide 7 reusable cloth pads for every pair of THINX underwear sold. This allows girls across Africa to continue their education (even when it’s their time of the month) and supports women factory workers employed by AFRIpads. To me, Miki had gone above and beyond having found a way to follow her passion and have international impact. Another speaker that impressed me, was artist/designer Elle Luna. Elle spoke of a dream that she had every night for months where she found herself in a beautiful white room. She said that her life changed when a friend asked her if she had ever tried looking for the room. This sent Elle on a Craigslist search that lastly several months until, one day, she finally had the keys to her dream room in her hands. Elle turned this room into her art studio, where she would paint and paint to her heart’s desire. Elle spoke of her idea of “should vs. must,” which she created into an illustrated essay that went viral. This concept encourages each of us to follow what we must do in order to feel fulfilled in life, instead of what society says we should do.